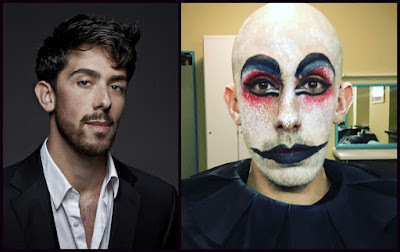 Last night, bass-barihunk Evan Hughes made his Komische Oper debut as Leporello in Herbert Fritsch's colorful, whimsical and provocative production of Mozart's Don Giovanni. He'll be singing along side Günter Papendell, who is singing the title role. Performances with the barihunk duo run through June 4th when Philipp Meierhöfer takes over as Leporello. Fritsch has drawn on the core of Don Juan story by bringing him to life as a malicious harlequin – a loser, audacious, side-splittingly funny and irresistible all at once. 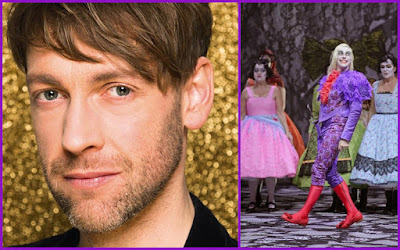 Papendell, who has become a fan favorite at the Komische Oper, has been with the company since 2007 scored a huge success in this production last year. He can be see this season as Escamillo in Bizet's Carmen, Pollux in Rameau's Castor and Pollux, Figaro in Rossini's Il barbiere di Siviglia, the title role in Tchaikovsky's Eugene Onegin, Jason in Cherubini's Medea and Fritz in Wagner's Die Meistersinger von Nürnberg. You can watch his Onegin performance online for free by clicking HERE. Hughes is currently a fest member at the Semperoper Dresden where he can be seen as the Marchese d'Obigny in Verdi's La Traviata, Masetto and Leporello in Mozart's Don Giovanni, Schaunard in Puccini's La bohème, Cesare Angelotti in Puccini's Tosca and Guglielmo in Mozart's Così fan tutte.